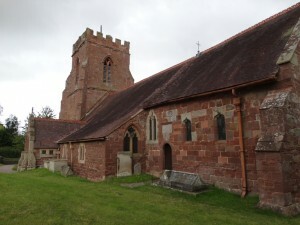 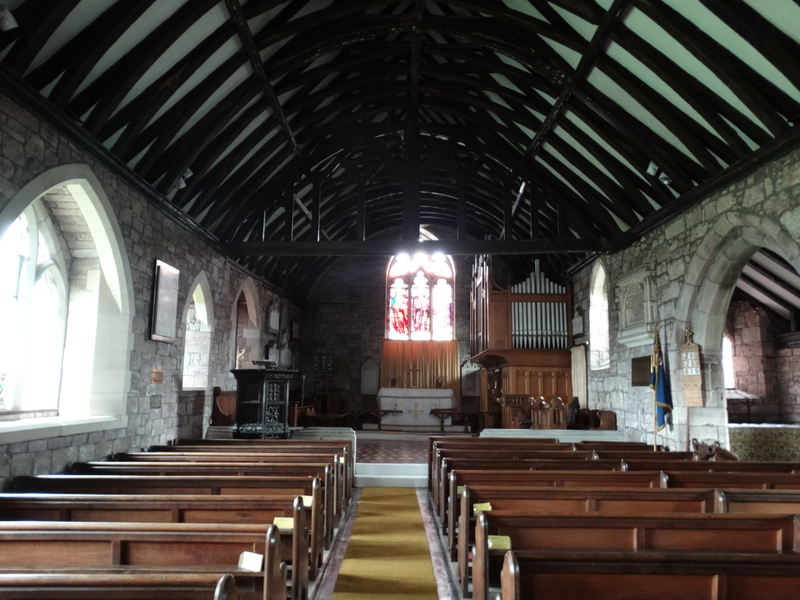 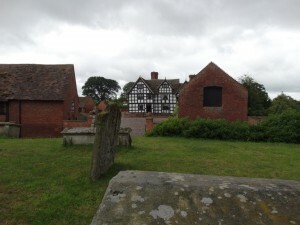 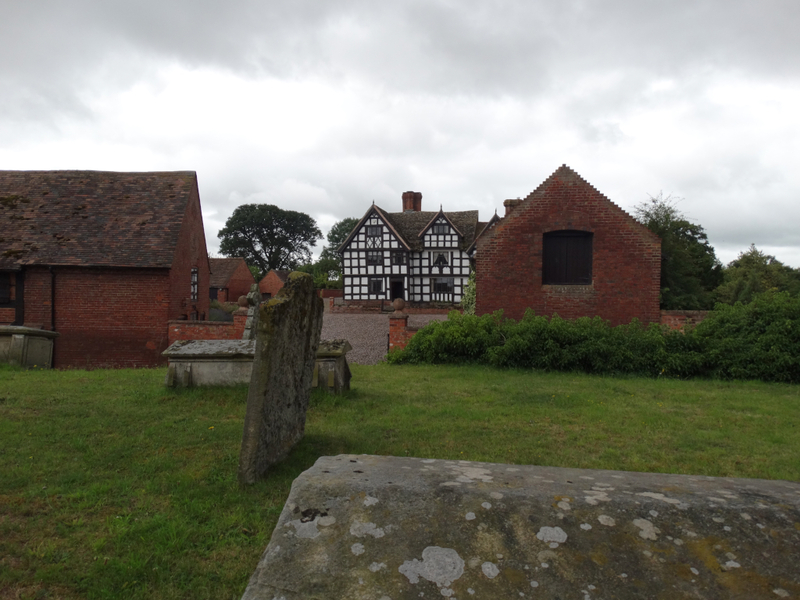 Thursday morning – let’s have an explore of village churches south of Shrewsbury. We started at All Saints, Berrington SJ530069. Narrow roads past lovely houses bought us to this church with a nice solid tower. 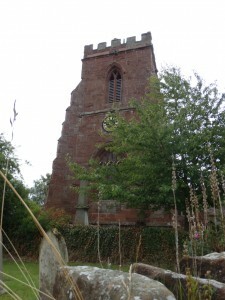 It is in a circular churchyard – a pre-Christian sacred grove? 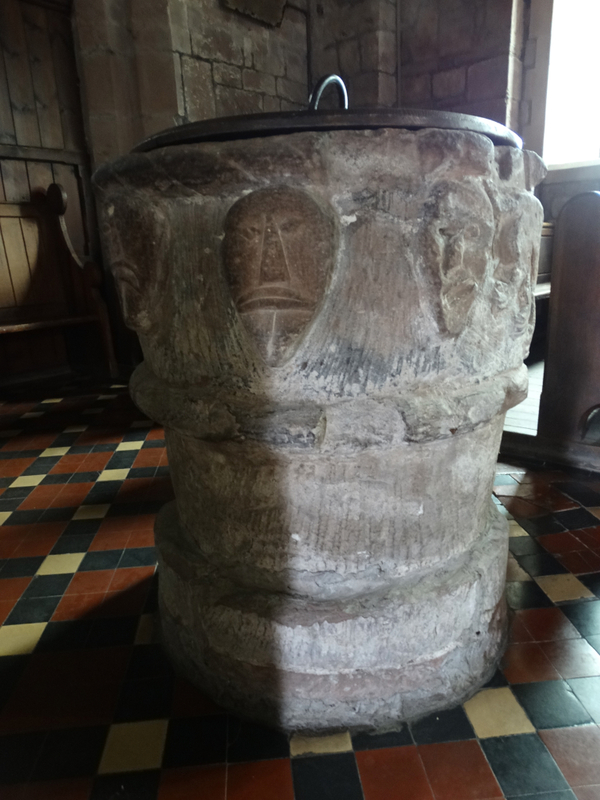 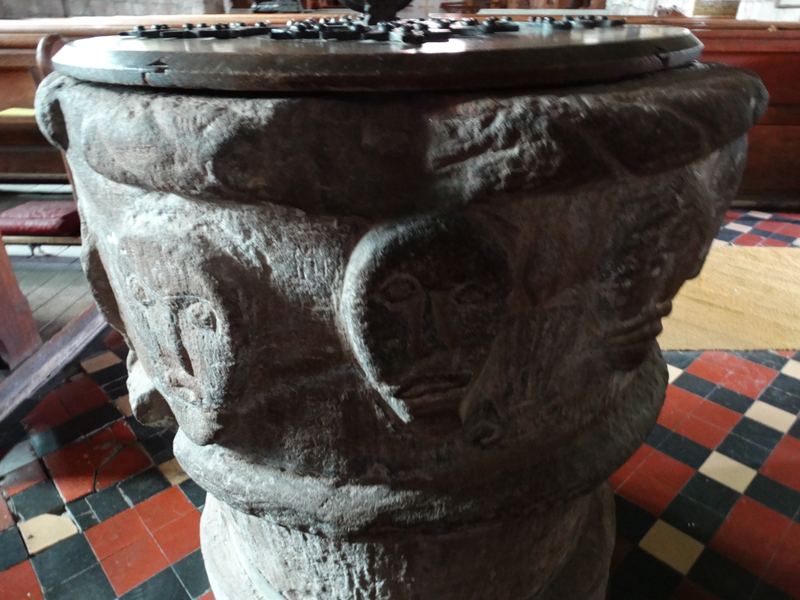 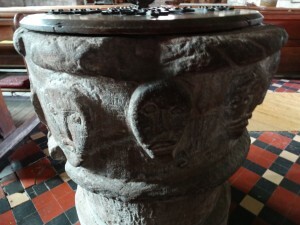 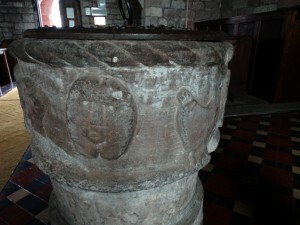 The church was mentioned in Domesday, and the font is probably from a similar time. Seven heads accompanied by a lighted candle, a beast of some form, and a cockerel. 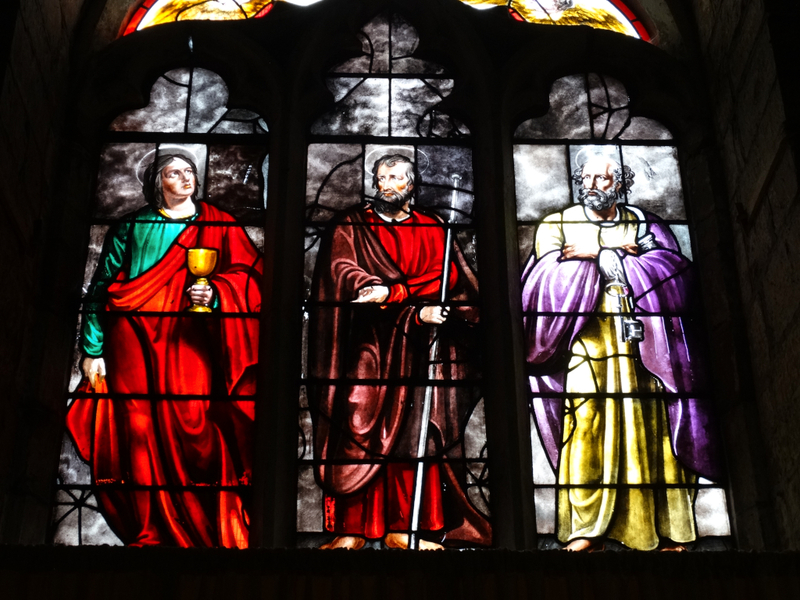 Light of the world, beast perhaps equals lion (“Your adversary the devil, as a roaring lion” 1 Peter), and denial of Christ. 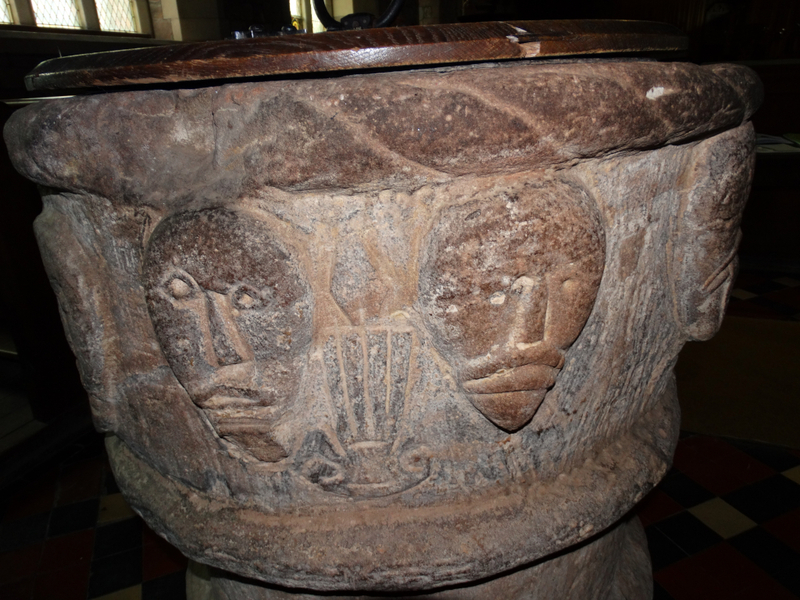 High up on the wall above the font – and I should have taken a wider picture – are these C13 carvings. 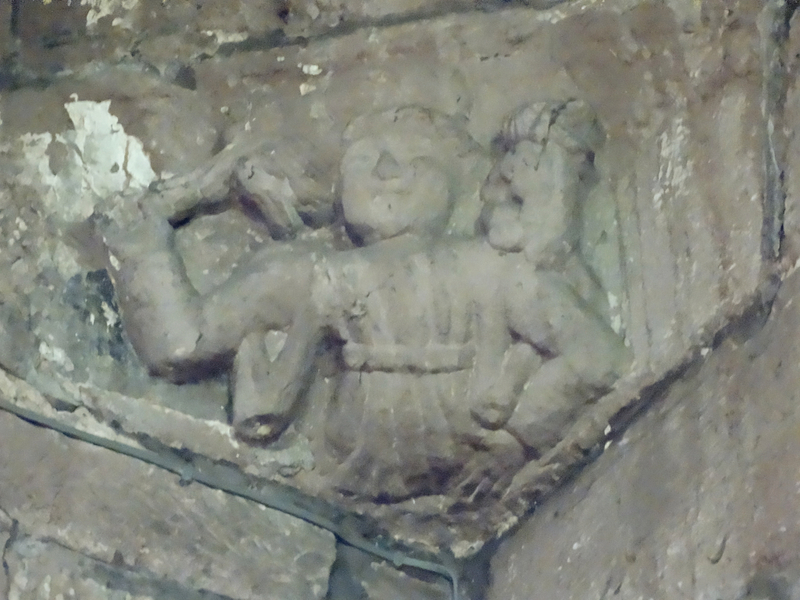 The top one, in the NW corner, wears some sort of frilled cape, and the SW one seems to have a devil on its left shoulder and a stick in his right hand. 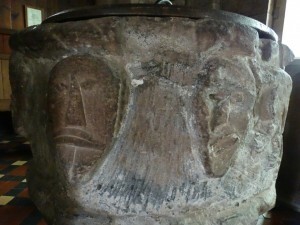 Remember that when we spill salt we throw it over the left shoulder into the face of the devil – is the figure on the left (when viewed from the altar) the damned, and the other blessed? 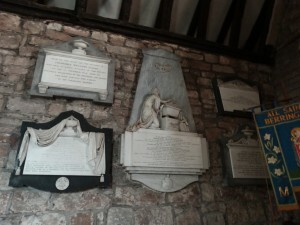 Up by the altar are these Williams memorials. 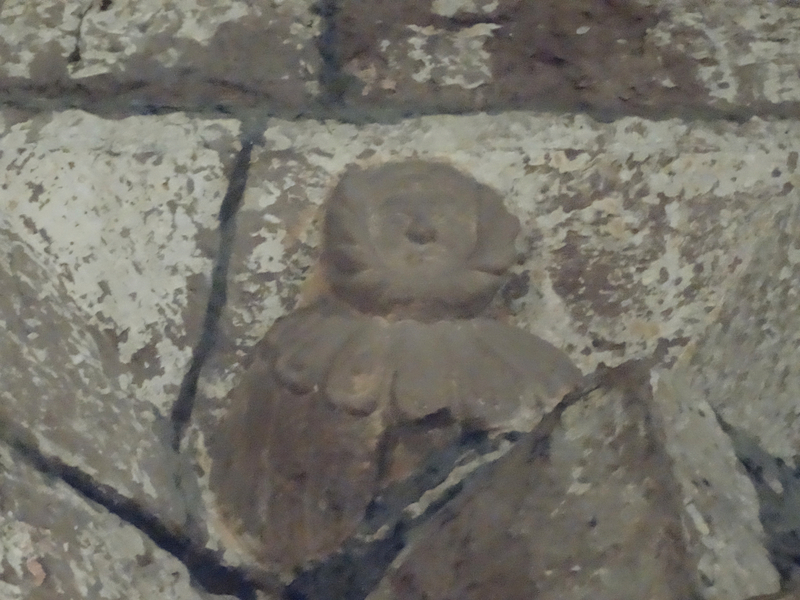 They will repay closer inspection. 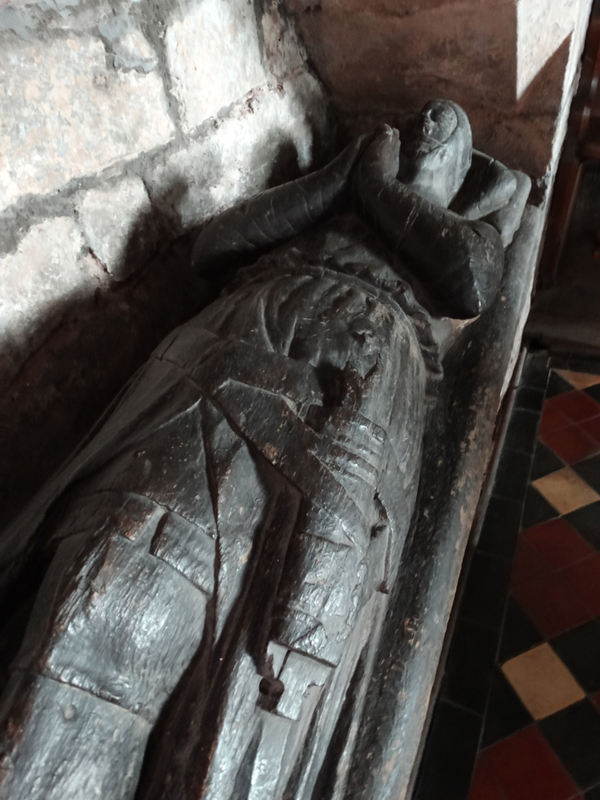 The kneeling figure resting upon a sarcophagus is by John Bacon the younger, and is in memory of Rebekah Gillian Williams, who died in 1827. 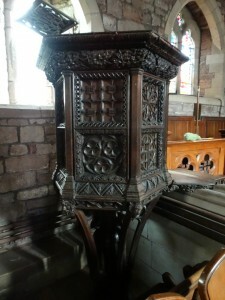 The pulpit was carved and given by Edward Hughes of Shrewsbury. 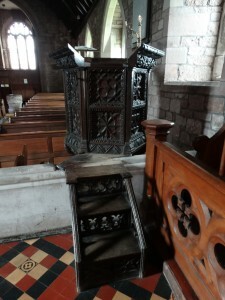 The floor had to be lowered to fit it in. 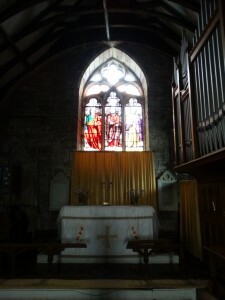 The glass in the east window dates to c1820, and is the work of David Evans of Shrewsbury. 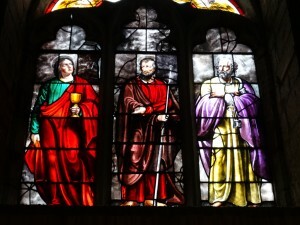 St John the Evangelist, John the Baptist and St Peter. 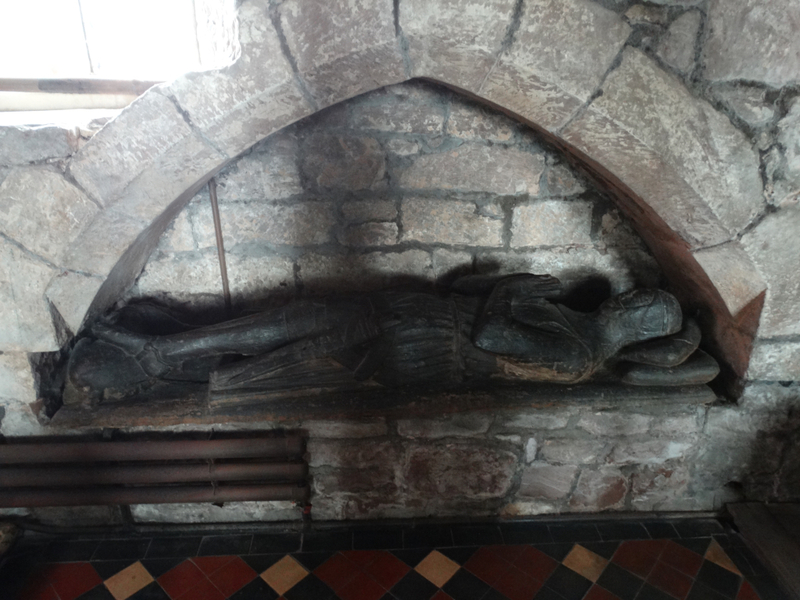 The cross-legged knight, his head resting upon two diagonally placed cushions and his feet upon a carved lion, is made of wood and dates to late C13 or early C14. He is known as Old Scriven, although his true identity has been lost. He was possibly a member of the Lee family of Langley, near Acton Burnell, who were then patrons of All Saints. 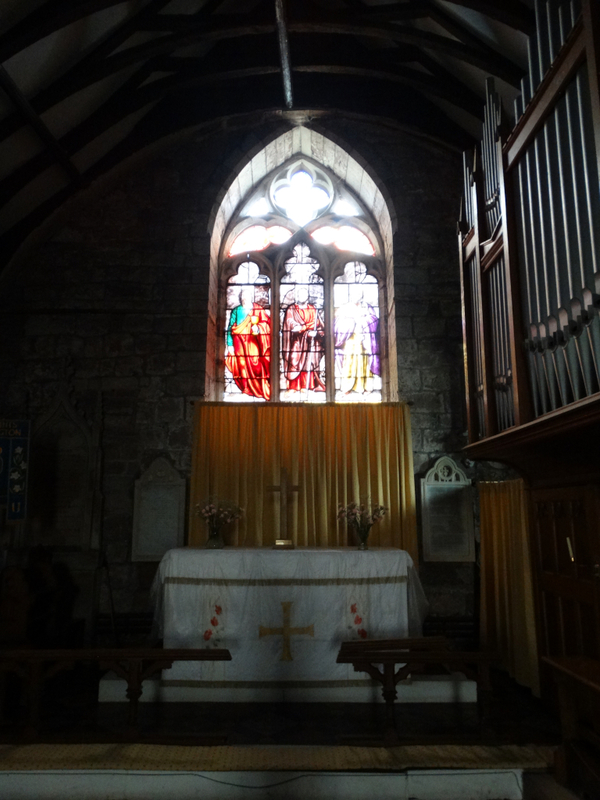 They may well have paid for the considerable alterations to the church which took place about this time. 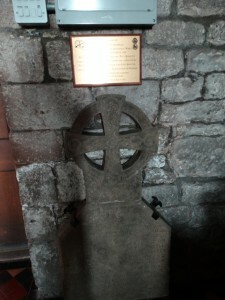 The original inscription to the Celtic cross read “In memory of John Owen late Color Sergeant in the 74th Highlanders with which Regiment he served in the Peninsular War under Arthur Duke of Wellington and was engaged in the Battles of Salamanca, Vittoria, Pyrenees, Nivelle, Orthes, Toulouse, and at the Sieges of Ciudad Rodrigo and Badajaz for which he received the medal and eight clasps. 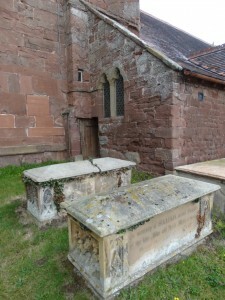 He died at Shrewsbury 16th April 1880 aged 88” and was buried in the churchyard. 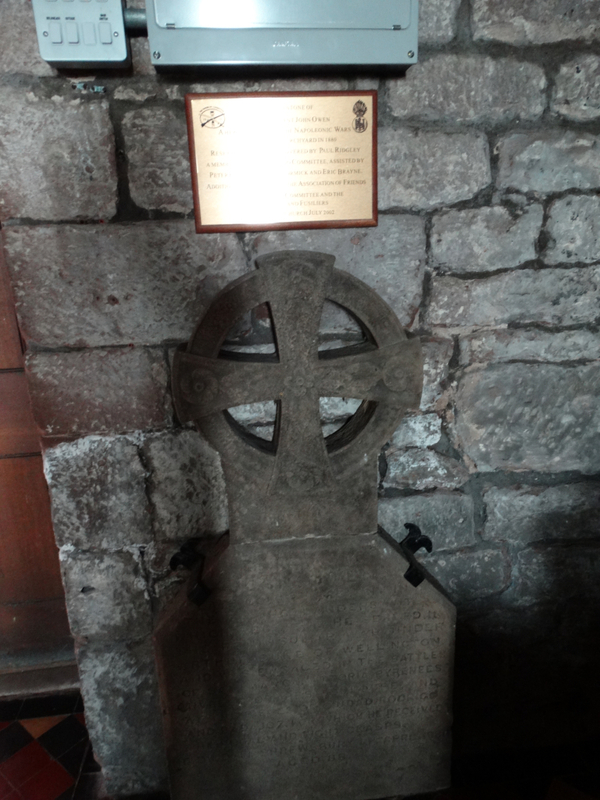 The gravestone was found in 2001, repaired, and is now placed in church. 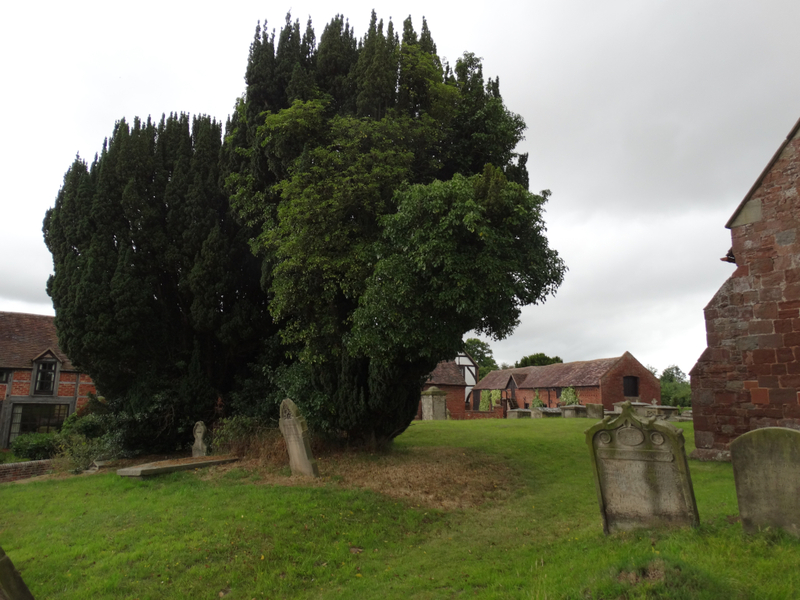 I wonder how old this yew tree is – what a huge amount of history and faith in one small village.